We’re used to Ferraris being compared to Lamborghinis, Aston Martins, Porsches and so on. But to give you some idea of the kind of car the new GTC4 Lusso really is, let’s instead take that ‘lusso’, or luxury, at its word and see how it stands next to the most successful luxury car in the world: the Mercedes-Benz S-Class saloon. The S-Class is enormous. It needs to be in order to seat up to five people in sumptuous space and carry their luggage, too. So would it surprise you to learn the Ferrari is just 12.4cm shorter than an S350d, or that Maranello’s car is only 4.5cm shorter in the wheelbase? It is perhaps less surprising that the Ferrari is the wider car, but which way would you go on weight? The limo or the four-seat supercar? You’re right: it is the Benz that’s heavier, but by just 35kg or, to put another way, a sack of spuds. 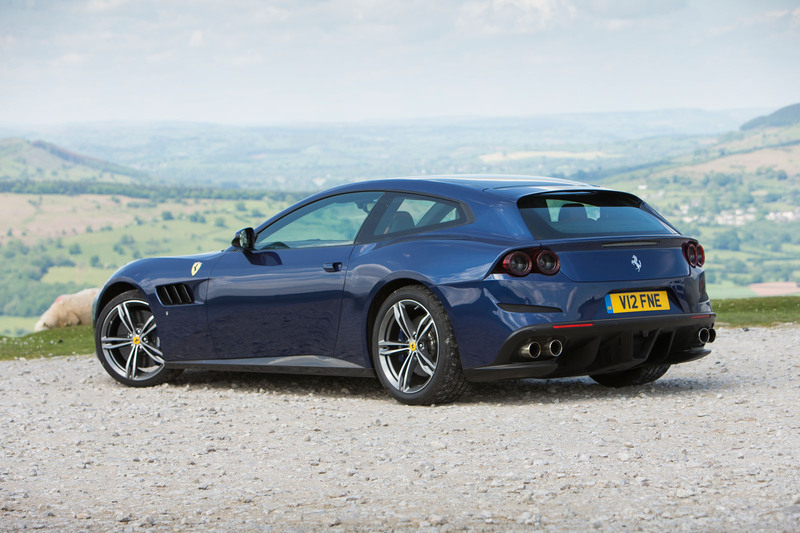 Of course, there’s nothing particularly new in this, given that the GTC4 Lusso is based on the five-year-old FF (although the transition has added 40kg), but after a day at the wheel it struck me that this car is now so far removed from traditional Ferrari blood-and-thunder territory that it merits being looked at from the other direction. So, luxurious it truly is. It may not have four doors, but plenty that do (the Aston Martin Rapide, old Porsche Panamera, to name but two) are nothing like as commodious in the back seats. I’m 6ft 4in and could sit quite happily in the back until the tank ran dry. For the GTC4 Lusso, the entire ambience of the interior has been lifted. 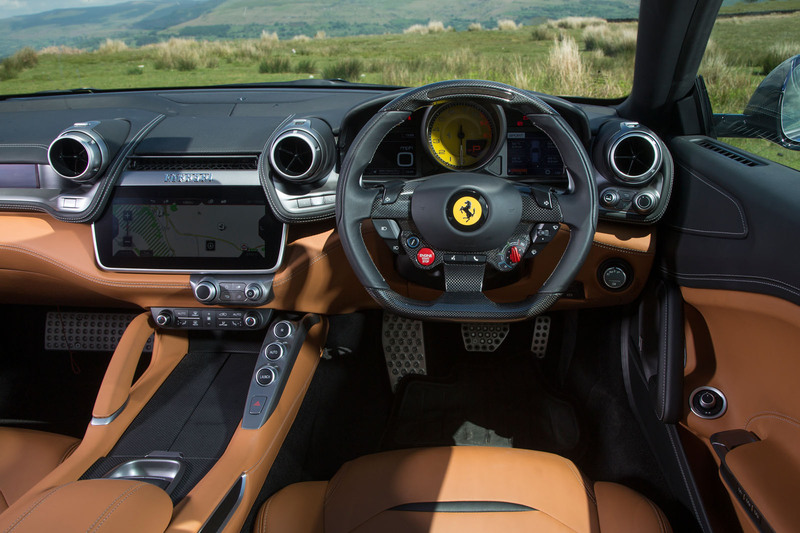 There have been plenty of Ferrari cabins that have looked gorgeous but few, perhaps none, that have been as easy on the fingers as on the eye. A new Delphi infotainment system uses a touchsensitive display and duplicate buttons for those not wanting to smear the screen. The man from Ferrari advised taking some time to learn its ways first, which in this business is usually code for ‘spend the rest of your life and you’ll still not figure it out’, but I found it instantly intuitive to use. The graphics and ergonomics are not quite German premium-league, but the days of sticking a proprietary sat-nav to the screen, or using a system that makes you want to hit your head on the steering wheel, are over. Put it this way: I tried the GTC4 Lusso’s Apple CarPlay but quickly reverted to the in-house system. For Ferrari, this is a revolution. Why this now? Why not tales of wailing V12s, whipcrack gearshifts and cheek-rippling apex speed? Well we’ll get to that shortly, but my first interest in this car, as Ferrari’s most luxurious product to date, is how well it lives up to a name first given to a knee-tremblingly beautiful (although dynamically unremarkable) 1963 Ferrari 250GT. It does it phenomenally well. It appears not to matter that the V12 up front squeezes 681bhp from its 6.3-litre capacity when at a steady motorway speed it is almost inaudible. Tyre and window noise are equally and admirably muted: this Ferrari has double glazing for goodness’ sake. And the ride? Well, exquisite would not be too strong in the context of a car whose suspension and tyre sidewalls must be strong enough to withstand a top speed of 214mph – just 3mph down on the LaFerrari. It’s supple, subtle and beautifully damped. 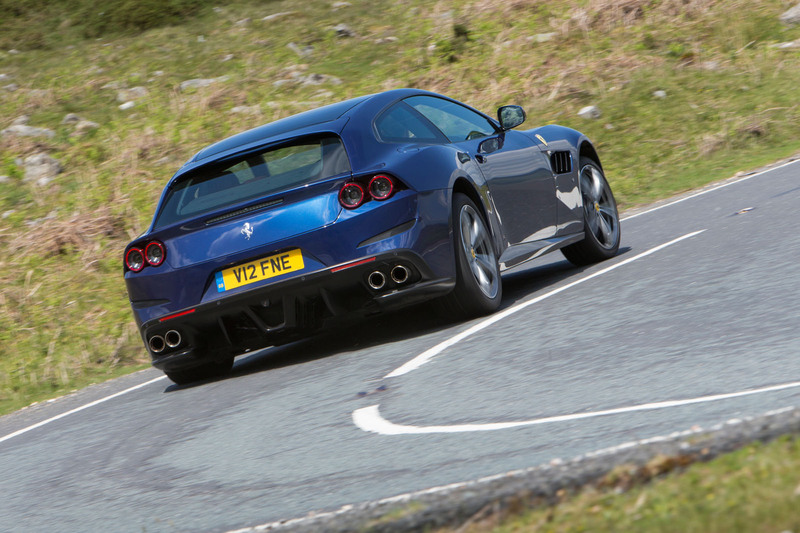 Even the 812 Superfast you’ll read about soon is unlikely to be more appropriately named than this. However, let us not forget that this is a Ferrari, and the moment you slap Count Baracca’s shield on the side you’re making a promise that the car that’s carrying it had better keep in full – which means it needs to have an engine that doesn’t so much pluck at your heartstrings as threaten to tear them clean out of your chest. The Lusso has that engine. What’s so clever is the way the engine’s character can be turned on or off by a nudge of the foot. My judgement is that in a more sporting Ferrari such an F12, you always want some form of audible accompaniment from under the bonnet, even when cruising, just to perpetuate the sense of occasion. In the GTC4 Lusso you want silence, then majesty on command, which is exactly what it provides. For sheer aural class there is nothing on sale that beats this motor: an Aston V12 Vantage is probably even more exciting to listen to, a Mercedes twin turbo V8 more laden with promise, but the sound of this Ferrari is to me the sound of the supercar in its purest form. In its richly layered yet diamondsharp voice lie the echoes of the GTO and Daytona. That it also bowls almost two tonnes of aluminium, leather, oil, water and carbonfibre up the road at a fairly ridiculous rate should be taken as a given. So I wish I liked more the way the Lusso handles. I know back-road brilliance probably isn’t that high up the priority list for such a car and I’d hate to think of that ride quality being compromised, but the fact is that, despite its new four-wheel steering system, the Lusso suffers from the same steering flaws as too many Ferraris of the recent past: it’s needlessly aggressive off-centre, a fault compounded by the fact that, despite it retaining hydraulic assistance, proper steering feel is minimal. 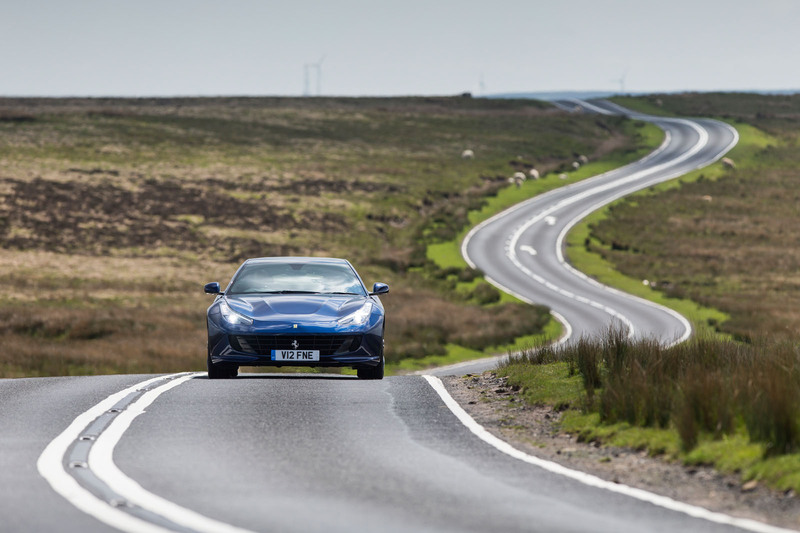 In a car with the wheelbase and width of the GTC4 Lusso it matters even more because it makes the car hard to place when driven reasonably rapidly, even on quick A-roads if they’re at all winding. Anything that acts as a deterrent to you enjoying your Ferrari on a good road cannot be a good thing. I also found the brakes a little over-assisted and was annoyed to discover that if you gave the left-hand pedal a decent stab to shed some speed, the car thinks you’re about to crash and starts noisily flashing the hazard lights to alert you and other drivers. 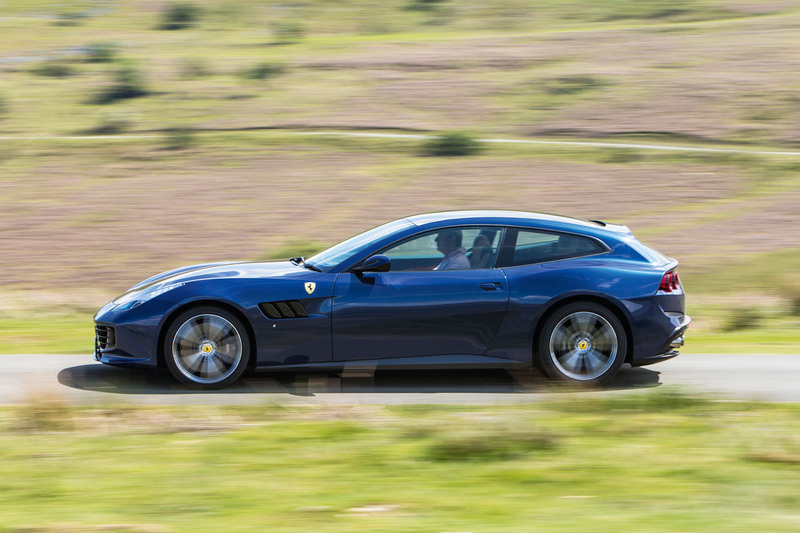 These gripes in no way change the fact that the GTC4 Lusso is spectacularly good at the job it has set out to do, whether you think that an appropriate one for a Ferrari or not. Ferrari would like you to think the Lusso a car without rivals, but I am struck by the fact that an Aston Martin DB11 is an entire S-Class more affordable, would be no slower point-to-point and is probably more fun to drive, too. Then again, the Aston is far less practical than the Ferrari, with less interior room and lacking four-wheel drive. But Ferrari is right: there is no other ultra-high-performance coupe on sale that offers this level of luxury, space and practicality. As a spacious supercar its flaws are obvious, but as an ultra-fast luxury car it lives in a class of one. An article on a big, fat, ugly car should not be published so close to breakfast time. It's too big and ugly from the outside, but it's the inside that Ferrari has hit a new low. No elements work together, either in harmony or in contrast. Just look at the centre of the dashboard with the eyeball vents framing the satnav which has its top corners cut off, a cheap metal strip above, some rectangular buttons below the airvents at an incline (while other buttons are level and circular) I could go on. Is this what the best Italian design has to offer? It is a very good car. I recommended it to my brother as an alternative choice to a McLaren 570S. For everyday practical use the Ferrari GTC4 Lusso is a good option and it has the V12 engine. "I’m 6ft 4in and could sit quite happily in the back until the tank ran dry." Yes, even the 911 is getting wider and wider, let alone Italian supercars. For me the best size is the air-cooled 911, plus thin pillars for great visibility and headlamp bulge to place the car. I really like the whole concept of this car; it's a bit of a throwback to the Anglo-Italian GT cars of the 1960s and early 70s, however, the execution has come up short in the delivery. The exterior is great but the interior is just too much, those air vents are hideous and some of the switches look to have been added as an afterthought. It just needs a bit more restraint in the cabin and this could be a stunning GT car. Sadly, given the majority of current Ferrari purchasers tastes/nationalities, restraint isn't something you are going to see in any supercar soon. The good old days of the 60's/70's when the jet set had restraint and 'class' are a distant memory. Just look at how beautiful a 250 Lusso is without shouting about it, or a 330/365 GTC or even a 365GTB/4. Really from the 512 Testarossa onwards many of the great Italian Grand Tourers (not just Ferrari) have become brash to say the least............ as have the private Yachts, some of which look ill proportioned and military in style. The FERRARI website quotes the top speed as 335 KPH = 208 MPH. F12 Berlinetta has 50 BHP more than the GTC4 Lusso with a top speed of 340 KPH = 211 MPH. Although it has been clocked at 217. Has the 214 MPH figure that is quoted been achieved on a timed run ?